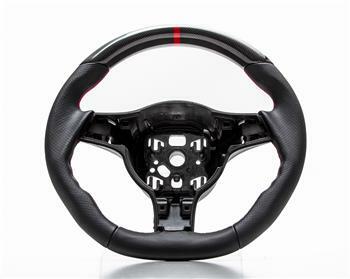 New from Agency Power is our line of Sport Steering Wheels for your vehicle. Made in Germany, these steering wheels are built off of OEM units which fit into custom molds retaining the factory inner ring. To meet strict TUV standards, the inner ring is kept in original shape for safety reasons. While still being able to offer a semi flat bottom, structural integrity and consumer well being is priority. The Agency Power Sport Steering Wheels give you a more enjoyable driving experience. With more ergonomic hand positions to increase driving comfort as well as a semi flat bottom for increased driver clearance, these upgraded steering wheels are a must have for any enthusiast. In addition to dressing up the interior of your car, these steering wheels will make you want to be behind the wheel more often with hands on 10 and 2! The Agency Power Sport Steering Wheels are custom made to order based on your specifications and options you choose. The steering wheels do not include the airbag, trim, or buttons. Your factory trim, buttons, and airbag is transferred over to the new steering wheel. There is a core charge as we require the original wheel back. This core charge is fully refundable once the wheel is received back at Agency Power Headquarters Here. If you choose to keep your original steering wheel, you will not be refunded the core deposit. Typical lead time on the steering wheels is 3-4 weeks. Some wheels may be in stock at the time of order so contact a Performance Specialist with any questions you may have.